Wythenshawe Community Housing Group’s Real Food team have been helping at Ronald McDonald House in Manchester this April. 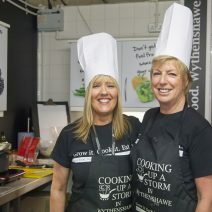 The team run ‘Emmie’s Kitchen’ from McDonald House once a month, where they showcase healthy recipes and cook them for the people staying at the facility; which offers free ‘home away from home’ accommodation to families with children receiving treatment in the Royal Manchester Children’s Hospital and St Mary’s Neonatal Unit. In March, over 80 parents attended the event which continues to go from strength to strength since it launched back in June 2018. McDonald House is open 365 days a year and is equipped with everything you would find in a family home. It gives families the chance to get a good night’s sleep and prepare their own meals knowing that they’re only a moments away from their children. Interim Group Chief Executive Kevin Lowry, said, “We are very proud of the work that Real Food are doing, not only here in Wythenshawe but the wider community of Greater Manchester. The team are making a real difference for the people who are staying at McDonald House. Keep up the good work!”.